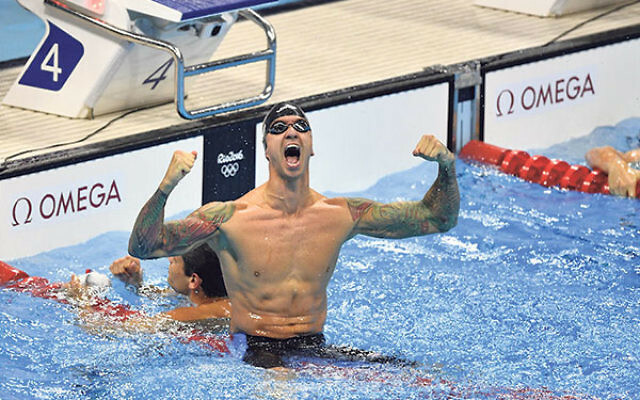 Anthony Ervin reacting after winning the men’s 50-meter freestyle final at the Olympic Aquatics Stadium in Rio de Janeiro. Under the auspices of the International Olympic Committee, Brazilian senior officials joined sports activists from Israel and elsewhere at a commemoration of the 11 Israeli victims of the 1972 Munich Olympics massacre. The Israeli and Brazilian Olympic committees and members of the local Jewish community attended the event on Aug. 14 at Rio City Hall. Israel’s most senior representative to the games, Culture and Sports Minister Miri Regev, said terrorism “does not differentiate [between] people” and reaches everyone. Unlike previous Olympic commemorations dealing with the 1972 massacre, this event was entirely devoted to the murdered Israelis. A previous homage was held Aug. 4 at a memorial site in the Olympic Village, where not only the Israelis were honored, but also four others who were killed during Olympic Games. 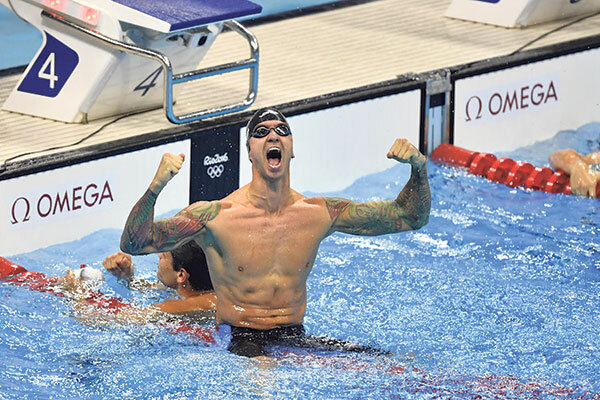 You’re never too old: Jewish swimmer Anthony Ervin became the oldest Olympic gold medalist in an individual swimming event, at 35 capping a comeback from burnout and drug use in the aftermath of his gold medal at 19. Ervin edged France’s Florent Manaudou by one one-hundredth of a second in the men’s 50-meter freestyle race in Rio on Aug. 12. He won his first Olympic gold medal in the same event in 2000. History repeats: For the second time this month Ryan Braun drove in at least six runs in a single game (he had seven on Aug. 6). Braun hit two home runs and a double to drive in all but one of the Milwaukee Brewers’ runs in their 7-3 win over the visiting Cincinnati Reds on Aug. 14. That brought his season totals to 22 round-trippers and 65 RBI, not bad considering he missed 20 games. Phil Weintraub, a first baseman for the NY Giants, holds the record for most RBI in a game by a Jewish player, with 11.